Freedom, independence and security. These are the fundamental values that each person, society and state aspires to. Ideas, philosophical thoughts and academic justification of these ideas were formed in the early stages of human civilization, starting with the idea of a person’s freedom, by defining the individual’s natural rights and principles, until the idea of the necessity of establishing a legal state as consequence of public consensus was emerged. At the core of a modern legal state, freedom is manifested by democracy; here freedom is a manifestation of a free will and independence of a citizen in political processes, one’s involvement in the political decision-making, thus securing freedom within the state via constitution and the rights, and independence in the outer world ‒ via legitimate power. These two sides of the same coin, as a result, establish a stable state at the same time defining its security. During the lecture the correlation and relation of fundamental values such as freedom as marker of democracy, independence as sovereignty and security as insurance will be discussed. Also, different discourses on the relations of those values and ideas will be considered in the context of the new Armenian political thought. 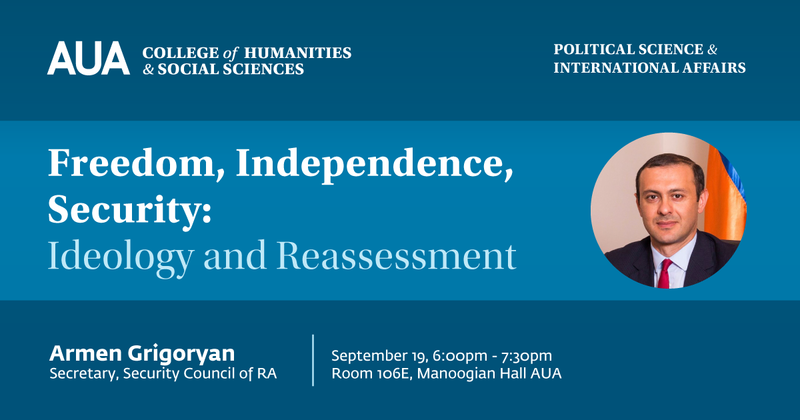 Armen Grigoryan holds a Bachelor’s Degree in International Relations from Yerevan State University (YSU) and a Master’s Degree in Political Science and International Relations from the American University of Armenia (AUA). He has taken part in different International educational programs in Finland, Italy, Czech Republic, etc. Grigoryan’s work experience includes positions at Counterpart International Inc., Armenia Office, and Election Program Coordinator at Transparency International Anticorruption Center NGO. He is a visiting lecturer at the Russian-Armenian University. On May 17, 2018, Grigoryan was appointed to the post of Security Council Secretary, RA.